Partial cooking of food by plunging in boiling water for a short period and then rapidly cooling in cold water or an ice bath for a short time to stop the cooking (known as shocking). (1) Blanching is used to prevent green vegetables, such as broccoli and spinach, from oxidizing and to maintain their bright green color. It also keeps vegetables crisp and tender. 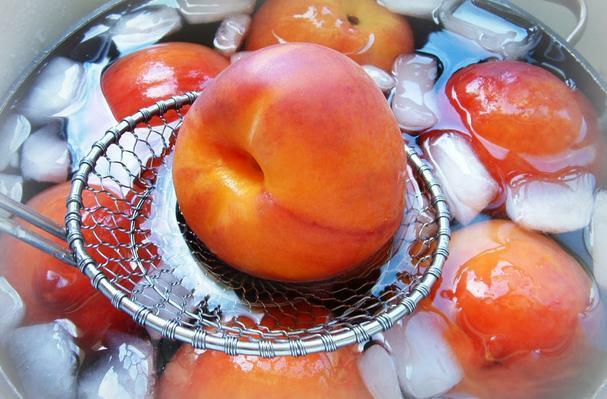 (2) It can be used to loosen fruit or vegetable skins to make peeling easier. Blanching can also be done to remove the skins from certain nuts like peanuts (technically a legume) and almonds. When blanching fruits or vegetables to aid in peeling, I use the minimum time needed to make peeling easy without overcooking. This can easily be done and time adjusted as needed. The quality and ripeness of the fruit or vegetables will make the difference in whether they are heated for 30 to 60 seconds.